The title and quote are drawn from the writings of Ad Reinhart, an American minimalist painter and bad boy art philosopher & poet, who railed against the obscene commercialization of high art in the post WW2 era. I reprint the poem here without permission of the publisher. Reinhart’s writings are recommended to anyone interested in Modern Art criticism. And, if you happen to be the person who without permission removed this work from the venue where it was hanging, please return it. There is just one first version of this painting. There is just one art, one art-as-art. There is just one fine art, one abstract art, one free art. There is just one museum of fine art everywhere. There is just one art history, one art evolution, one art progress. There is just one aesthetics, just one art idea, one art meaning, just one principle, one force. There is just one truth in art, one form, one change, one secrecy. There is just one artist always. 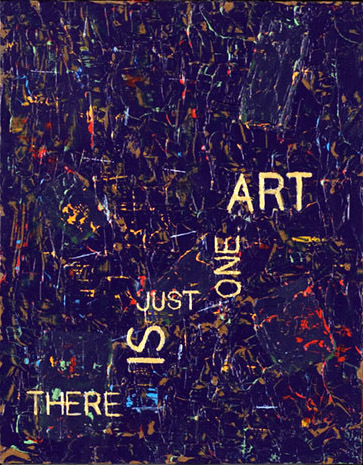 There is just one artist-as-artist in the artist, just one artist in the artist-as-artist. There is just one process, just one art invention, just one art discovery, just one art routine. There is just one art work, just one art working, just one art non working, one ritual, one attention. There is just one painting, one brushworking, one brush overworking. There is just one painting everytime. There is just one direction, one directionlessness, one size, one sizelessness, one form, one formlessness, one formula, one formulalessness, one formulation. There is just one image, one imagelessness, one plane, one depth, one flatness, one color, one colorlessness, one light, one space, one time, one timelessness. There is just one repetition, one destruction, one construction, one dissolution, one evanescence. There is just one abstraction, one rhythm, one eloquence. There is just one style, one stylelessness, one matter, one sequence, one series, one convention, one tradi¬tion. There is just one qualitylessness, one object, one subject, one standard. There is just one edge, one framework, one ground, one existence, one fabric, one focus. There is just one way, one side, one vision, one freedom. There is just one problem, one task, one obligation, one struggle, one victory, one disciple. There is just one negation, one value, one symmetry, one monochrome, one touch, one energy. There is just one shape, one square, one execution, one transcendence. There is just one method, one manner, one interlace, one overall, one overlap, one order, one rule, one thought, one spontaneity. There is just one material, one materiality, one density, one presence, one absence, one disembodiment. There is just one simplicity, one complexity, one spirituality, one uselessness, one meaninglessness. There is just one statement, one technique, one texture, one importance, one silence, one texturelessness. There is just one reason, one means, one emptiness, one irreducibility, one end. There is just one art morality, just one art immorality, one art enemy, one art indignity, one art punishment, one art danger, one art guilt, one art virtue, one art reward. There is just one art, one artlessness, one painting, one painterliness, one painterlilessness. There is just one difference, one sameness, one consciousness, one nothingness, one rightness, one indivisibility, one essence, one fineness. There is just one thing to be said, just one thing not to be said.